Hope thread waits for me. It's still morning in Hawaii. Us twitching over "reload" waiting for it. Last edited by AndyTiedye; 02-10-2009 at 03:37 PM. looks great, but i just got a mizer! so this runs for ~28 hours on low, and the mizer 45? will I miss the Haiku wave? "You only live once, do it right and once is enough"
Very nice light Don, I guess my first post should be in this forum. That Haiku looks awesome Don! Nice work Don! I hope to be able to get one of these at some point. Don, now that this wave is over, please don't name your next light "The Ballet", we don't need a lot of pictures or videos of people in tutu's. Ah, just another benefit of living in Hawaii. Got the light in today and it is much better looking in person. Great machining on all parts. Throw with the McR17 is much better than I thought. Of course pumping out all those lumens doesn't hurt performance. Gamble paid off. Got the light. WOWSERS. Don, you have another raving success on your hands. LOVE the three levels. I have noted that sometimes it comes on at the last level, other times not. Is there a trick I haven't figured out yet? I have not yet noted flickering, but then again, I've just been playing under my desk. Someone is going to come in my office and think I'm taking a nap under there. Gamble paid off. Got the light. WOWSERS. I'm glad the expedited shipping paid off for you! I am still hoping for delivery tomorrow or I will be waiting until Tuesday. Also crawling under a desk to play with a new flashlight shows you have a severe case of Flashoholism! ..... I have noted that sometimes it comes on at the last level, other times not. Is there a trick I haven't figured out yet? If it is coming on in a different level then you only had it "off" for less than a second. The period that the light is on has no effect on changing levels. You can do a very quick flash and this won't change anything. However if you turn it off and then back on quickly, it will advance through the cycle. THANKS! That makes a lot of sense, and I wish others had designed theirs so. Well, back under the desk for me! While I still see the LunaSol20 as being the perfect light for me, the Haiku is a GREAT compliment. If you like the PD-S, the Haiku will become an instant favorite. To me, it is the next evolutionary step up from the PD-S...like getting a PD-S Mizer and a regular PD-S all in one. Before getting the light, I thought the UI was nothing really special. Multi-clicks have been around for a long time. While I have not used them all, this one in the Haiku stands out as being one of the most intuitive I've used in a long time. It is only a multi-level light when you want it to be. Hard to explain in writing, but once you pick one up and USE it the virtues of the UI become readily apparent. That's exactly what I was hoping for! I can get used to a lot of different interfaces, but I've grown to really like the Sundrop/Haiku's UI. At first, I thought having to toggle through high to get back to low would bother me, but that hasn't been the case. If I need to preserve night vision, it's simple to just cover the window up while toggling. 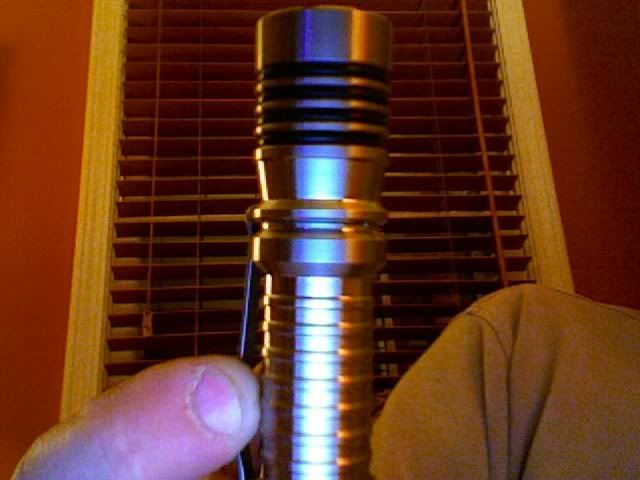 Now all we need is flexible titanium, so that Don can replace the rubber boot and put some tritium in! This is the light that I've been looking for , 3 levels with an xr17 reflector. Griff, is that your thumb, or pinky?! Dude, it's his index finger, right? damn, mine is in Kearny, NJ, probably won't make it tomorrow! Last edited by daloosh; 02-14-2009 at 12:04 AM. Haiku arrived today. It looks and functions perfectly! Great job Don! I really love the feel of the new switch and the UI. I had just bought a En Aleph Mule 1x123 from Don but decided to sell it before the LE arrived from the Shoppe (due to getting a used Ti PD Mule). Since I knew I was going to sell the light I didn't replace the stock boot with the silicon spare supplied by Don. I was blown away by the ease of switching the Haiku vs the Aleph Mule which I assume is due to the Haiku having the newer boot already installed. I am amazed it makes such a huge difference or does the Haiku have a different clickie switch? I was really happy to see the Haiku waiting for me this morning. I had assumed that Mr. Murphy would make me wait until Tuesday with the USPS closed Monday for the holiday. Thanks again Don for such great flashlights and fantastic service!